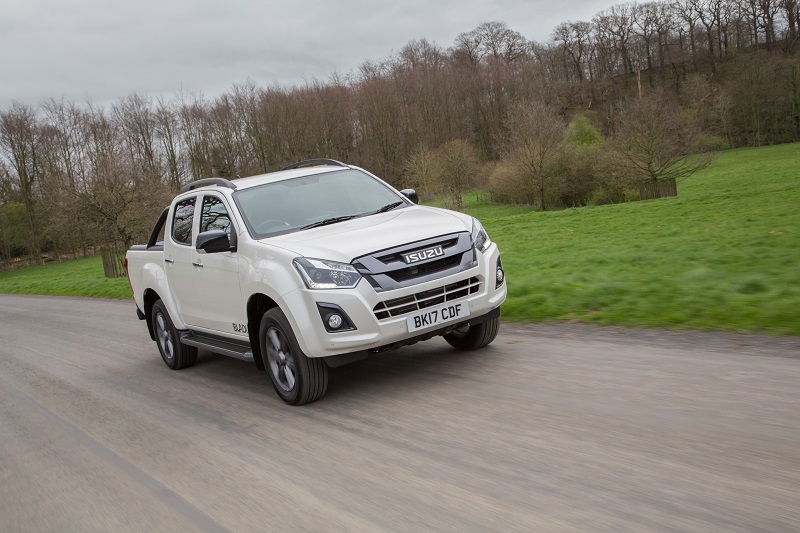 They tell it how it is in Yorkshire, so where better to learn that, when it comes to the latest Isuzu D Max pick up, beauty really is more than skin deep. 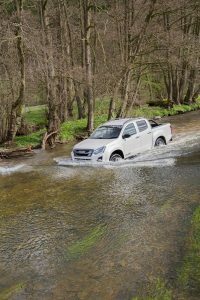 It’s fair to say that throughout its various incarnations, over 15 highly productive years, the Isuzu D Max has never really aroused the sort of ‘ooohs’ and ‘aaahs’ which have greeted a succession of competitive new models on the pick-up catwalk. 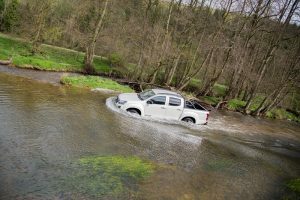 Despite a full body makeover in 2012 the second generation D Max was still resolutely all about rugged reliability, a genuine workhorse which continued the legacy of being equally as happy down amongst the muck and nettles of the farm or axle deep in muddy building sites. Okay, so the new breed of ‘pretty’ boys would get their share of admiring glances down at the beach or pony club but the good old D Max got all the adulation it needed fully loaded and resplendent in the builders’ merchant yard. So it comes as something of a relief to see first-hand, that despite a timely facelift, the Japanese stylists have used their metaphorical Botox and fillers sparely on the latest model and in doing so continue to prove that you don’t need stunning good looks to stand out from the latest “in” crowd. Appropriately enough, our test route would take us through the North Yorkshire National Park, a part of the country which enjoys some of the most ruggedly handsome scenery in Britain but can also test man and machinery to its limits. No doubt the biggest question on the mechanically enhanced lips of some of its closest competitors is whether the new 1.9l turbo diesel engine is up to the task, given that its predecessor employed the seemingly more robust 2.5 litre diesel unit. Unlike us, they will be disappointed to know that typically the latest power output develops a respectable 164 PS and 360 Nm of torque. That’s the equivalent of the former offering although, thanks to end user feedback, Isuzu has shortened the gearing so that the performance is the same, or better, throughout the new range. With the six-speed manual gearbox the RWD D Max returns an impressive 45.6 mpg with CO2 emissions of 163g/km, although this tails off noticeably on the 4×4 automatic version. However, users will appreciate that with Euro 6 standards met, the use of AdBlue is avoided completely with the new D Max and the five year or 125,000 miles warranty is another plus point over some of its rivals. At the same time, whilst the pick up market is increasingly moving towards manufacturers offering only double cab options, Isuzu is firmly committed to meeting all eventualities, from single cab to extended and double cab models with 4×2 and 4×4 drive trains, with shift on the fly. There are also five main specifications to choose from. The basic Utility model, Eiger, Yukon, Utah and Blade. Single cab vehicles are Utility only, while extended cab is available as Utility and Yukon versions. Double gives you the full choice of trim levels. So besides the engine what else is new? In truth, apart from some front end visual tweaks and equipment upgrades, not a huge amount, but in many respects that may be a good thing, because unlike some of its illustrious competitors, Isuzu has decided that bigger is not necessarily better. At 1,860mm wide and 5,295mm overall dimensions are pretty much the same, although thanks to that lighter engine the payload has been increased throughout the range from around 1,100-1,282kg, whilst the load bay has some small but useful bragging rights over some others in the sector. 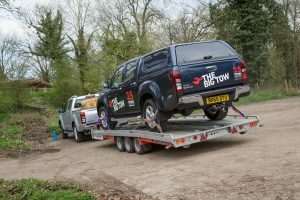 The towing weight for 4×4 models is 3,500kg dropping to 2,500kg on the RWD model, making it a very able all round workhorse. As you would expect at this mid-end range of the pick-up market, all models come with ABS brakes, electronic stability control and traction control and the front bumper and bonnet have been redesigned for hopefully redundant enhanced crash protection. The familiar wedge shape has clearly been working out with more muscular wings to deliver better aerodynamics whilst the roof has been designed to reduce drag. You pay your money and take your choice on interior trim levels, but for busy tradesmen there is definitely a welcome place for the very basic easy clean hard plastics found on the Utility. Even this, though, comes with Bluetooth connectivity, air conditioning, LED daytime running light and electric windows. A high driving position provides good all-round visibility and we never felt less than secure on some of the more challenging sections of the test route, although our particular automatic version didn’t quite seem to know exactly when to stick or twist on some particularly undulating parts of the ride. The manual version also complained a little noisily when changing down to build up speed and the short first gear requires some pretty hefty accelerator work to get into second when towing, although the Hill Start Assist and variable Hill Descent Control are helpful additions. However, those clever people in Japan have apparently devised a way of getting the vehicle to learn the driving habits of the pilot so perhaps, like our less than expertly performed reverse trailer parking element of the test, it says more about us than the new D Max! It won’t stop pick up admirers in their tracks but it is certainly worth a second look! Available in eight colours on the road prices start at around a very respectable £18,800 for the Utility rising to top of the range Blade from £33,500.